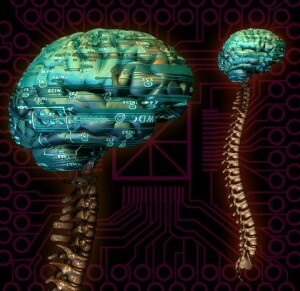 How do Vertebral Subluxations Affect Your Central Nervous System? Healthy nervous system free of subluxations allows the brain and body to work effectively. Last time we learned that the nervous system is the key to true health (everything working right) and that a common interference to the nervous system is a vertebral subluxation. You also learned that there are three basic causes of subluxations: Physical, Chemical, Emotional stresses. This time we are going to explore what we can do to help you and how long it may take. Most people get their first subluxation at birth. Birthing, for both mom and baby is traumatic even without any complications. It is wise for both mom and newborn to get their nervous system checked as soon as possible after birth. Only chiropractors can tell you if you have a vertebral subluxation. Vertebral subluxations are not always painful in the beginning. You may have some and not be in any pain! Chiropractic adjustments help the body right itself. The chiropractor uses diagnostic skills to locate primary points of tension and adjust you to give you maximum relief. Frequent, regular visits help overcome long standing subluxation patterns. You want to avoid the following scenario: if you sprain or strain your wrist it is better to get the wrist checked and adjusted right away. This will prevent future advanced degenerative changes from setting in within the joint. Where does chiropractic fit in our health care system. There’s a lot more to true health than you may know or realize. Two main chiropractic tenets are that: 1) The body is created with the ability to heal itself and 2) the body is designed to regulate itself with ease and grace. As we follow the recommendations of the chiropractor’s adjustment schedule all the while incorporating an anti-inflammatory diet and smart exercise, we can enjoy a healthy body that is better able to heal and regulate itself. With all our joints and bones in proper alignment, the electrical connections within the nervous system can operate efficiently and effectively. A happy nervous system creates a copacetic atmosphere throughout the body that is perfect for restoration and repair. If we have not been to a chiropractor for regular adjustments, these synapses become chaotic and inefficient. These are subluxations and can lead to fatigue, pain and ill health. Without attention, these subluxations can interfere with the body’s ability to heal. Want to learn more? Tour the practice website or ask Dr. Vera. You can also book a computerized nervous system scan to find out if there are subluxations. You may be surprised by the results.